Energy bills can soar in winter as we fight to keep the cold weather at bay. Louise Nurse, Sales and Marketing Manager for sara LBS looks at how heat loss in loading bays can be minimised and the other seasonal benefits of high speed doors. The days when employers could simply expect people to work in the cold are long gone. There is now legislation to protect employees from unacceptable practises and – more importantly – employers recognise that productivity is compromised when working conditions deteriorate. Working environments such as offices, shops and clinics are relatively easy to keep warm, comfortable and safe, but other places of work are more difficult; loading bays present a challenge that is probably unique. The defining characteristic of a loading bay is the main access door, sized to accommodate the rear of a lorry and through which the actual loading and/or unloading occurs. When the door is open, heat loss from the interior of the loading bay to the outside world is largely unhindered. Naturally when the door is closed heat retention is very much better, but in essence a loading bay earns it keep only when the door is open. So how can this dilemma be resolved? Many years ago, loading bay doors tended to be hinged, so that they swung open horizontally, and being made of timber were relatively heavy (but good heat insulators). Their weight meant it was usually normal working practise to open the doors when the first truck arrived and leave them open for the rest of the shift. This also tended to promote a culture in which the doors were kept open to signify that work was being done. 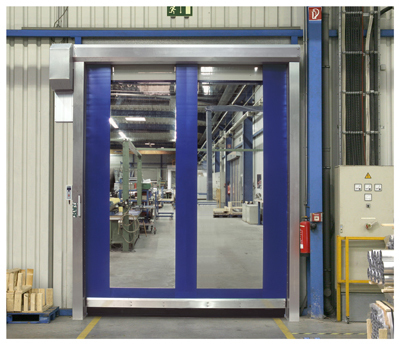 By replacing such doors with lightweight doors fitted with high speed opening/closing drives, a new culture evolved in which doors were kept closed as much as possible to retain heat. The doors could be opened at the flick of a switch as a vehicle reversed up to the bay and closed with equal ease as soon as the truck departed. Indeed, this idea is now often taken another step, by using induction loops or other presence sensors to automate the opening and closing. A typical sara LBS high speed door opens and closes at 2.5m/sec, so with most doors being 2.5m to 3.5 high the opening/closing time is around one second. The lightweight nature of such doors may suggest that they do not have much in the way of thermal insulating capacity; however, with modern materials this is easily addressed. Sara LBS has also pioneered a number of other solutions based on secondary curtains or reflective doors located just inside the main roller door, so that heat is retained within the main body of the loading bay. The thermal performance of the main roller doors can be enhanced by incorporating weather seals and draught excluders between the door’s panels and where the door edges meet the frame. While reducing heat loss in winter is a major benefit of high speed loading bay doors, there are also secondary benefits that can be very important. For instance, in the cold weather, wildlife and birds are just as keen on finding warmth as humans, so may be tempted to enter a loading bay in search of shelter. This could be a nuisance in most situations and could seriously compromise biosecurity in food and beverage, medical, pharmaceutical and other hygienic facilities. A high-speed door that is usually only open when there is a vehicle and workers in attendance will reduce the likelihood of this significantly. A high-speed door will also work to discourage potential intruders. The door itself is a physical barrier when closed, but perhaps more importantly because the door is closed almost as soon as the truck departs, there is less opportunity for passer-by to see into the loading bay and be tempted to consider wrongful entry. Closed doors also work to keep out and snow, rain or flowing water that penetrates overhead canopies and porches. High speed doors can be quickly shut so even rain and snow carried on strong winds has little chance to enter. High speed doors are recognised as helping improve the working environment of loading bays, which in turn leads to an improvement in productivity. In winter they are particularly useful as they are the prime tool in maintaining an acceptable working environment in which personnel can be productive and do not have to wear bulky coats and gloves that restrict dexterity. Furthermore, high speed doors help to reduce heat loss to the outside atmosphere, so can have a measurable effect of heating bills over the coldest part of each year.